Despite the semantics, mitered sticking is not difficult to make. 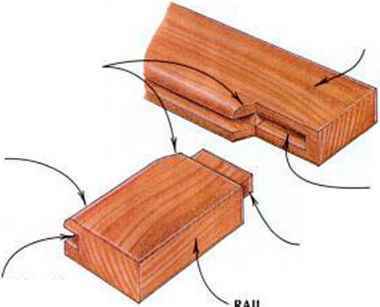 Once you've cut your tenons and chopped your mortises, you simply trim away the excess molding on the mortised pieces, and miter the molding on each piece where mortise meets tenon. 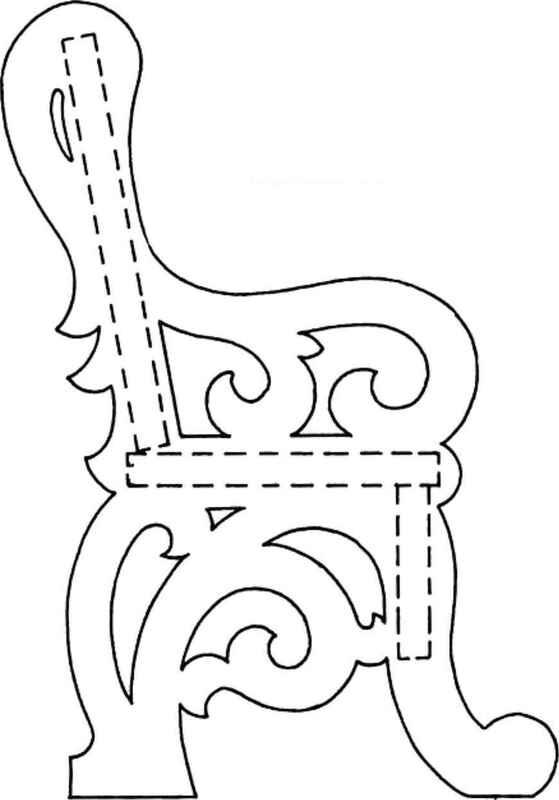 Scribe guidelines down the face of each mortised piece as shown in Q. These will help you saw away the excess and line up your mitering template accurately. No need for guidelines on tenoned pieces; you'll simply line up the mitering template with the tenon shoulder. Trim away the bulk of the molding below each mortise with a handsaw, as in Q. Do the final paring with the molding depth line clamped flush to your bench, as in Qj. Check your progress with a small try square. Be especially careful to keep your edges square on the mortised pieces—otherwise a gap will show in the finished joint. Pare the rest. Clamp the mortised stock in your bench vise, keeping the molding depth line flush with the benchtop. Then pare to the line with a chisel. Miter the molding. Clamp each frame member—mortised or tenoned—to the wraparound mitering template you used on the case joints. Pare the molding flush to the template. Saw the bulk. Use a handsaw to trim away most of the excess molding on the end of the mortised stock. A diagonal line will help you miter the molding accurately. A perfect fit. 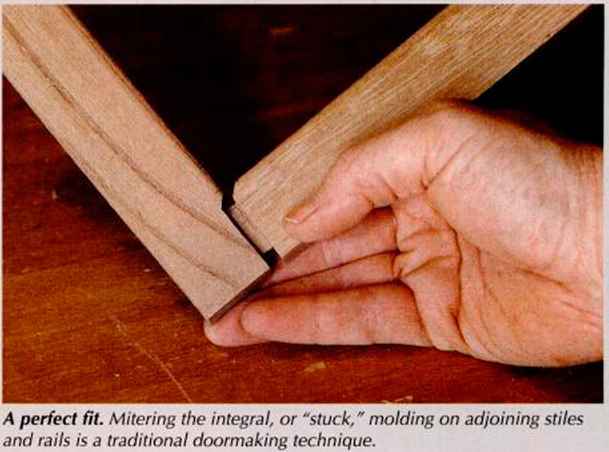 Mitering the integral, or "stuck," molding on adjoining stiles and rails is a traditional doormaking technique. ROUND-OVER "STUCK" MOLDING 3/16 R.